When it comes to revamping that fairway wood for a new season, there are few better than the PGA Tour metalwood leaders. Breaking boundaries with the original RBZ and its game-changing 'Speed Pocket' design back in 2012, TaylorMade has gone from strength to strength in the fairway wood category. It is no secret there have been a few models launched in recent years but it is also fair to say that each new model gets better, of which the M2 fairway wood for 2016 is no exception. A new multi material carbon crown creates 5g of discretionary weight savings and lowers the centre of gravity (CG), while the Speed Pocket has been made 22% more flexible than on the AeroBurner to create even more ball speed protection across the face. The AeroBurner was arguably the longest fairway wood we tested in 2015, but as our testing during the PGA Show in Orlando proved, the M2 - in the same 3-wood, 15-degree, stiff flex spec - dismantled it with ease. We love the low profile look of the M2 fairway wood, which just oozes class in the address position. The black and white provides fantastic face and crown differentiation, while the understated logo aids good alignment behind the ball. In terms of the revamped Speed Pocket, which is nearly a quarter more flexible than the AeroBurner, the smile shape of the slot remains but is part of a wider cut-through slot that enables the face to flex more at impact. 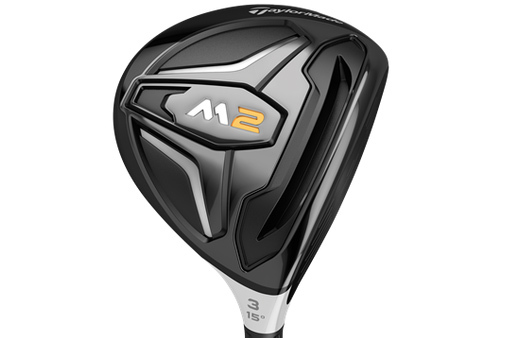 TaylorMade has been getting better and better at improving the feel and sound of its products and we believe the brand has finally got there with the M2 fairway wood. While the original RBZ was impressive in terms of looks and performance, the sound of it didn't necessarily keep you coming back for more. You could also say the same for other iterations. Making the Speed Pocket bigger and more flexible has its performance benefits, but the company claims that often detracts the sound as a result. After ample research and testing in the lab, TaylorMade has now found a way around it on the M2 by creating a new fluted hosel that dramatically improves the sound and feel. With a lighter carbon composite crown working in tangent with the fluted hosel, there is a lighter and far more pleasing sound at impact - as you can likely appreciate from our video review. And thankfully, the improved sound doesn't compromise the distance as we'll prove to you in a second. Feel is accentuated further with a superb stock Reax shaft, but if that doesn't float your boat, fear not as TaylorMade has other shafts available through custom fitting at no extra cost. During testing, TaylorMade staff player and 2015 US PGA champion Jason Day struck the new M2 fairway wood 11 yards further than his adored AeroBurner TP fairway wood. He also picked up more ball speed and less spin. The decision to switch has therefore become a no brainer for the talented Australian. While we cannot vouch for such yardage gains, we were more than chuffed with four yards of increased carry (237 yards) and seven yards of added total distance (259 yards), with 100 RPM less spin and 2 mph of added ball speed. Whether off a tee peg, fairway lie or first cut of rough, we noted superb turf interaction aided by its shallow head design. It also felt easy to get airborne on a consistent mid to high trajectory. This product is also extremely forgiving and the distance proved particularly consistent no matter the strike, much to do with the improved ball speed protection provided by the more flexible Speed Pocket. With added distance, improved sound and a ball flight that's easy on the eye, it's hardly surprising Mr Day is sticking this one straight in the bag. We touted the AeroBurner fairway wood as arguably the longest of all time, but the new M2 now takes that mantle following improvements to all our statistics in the same specs. Sweet sounding, just like the impressive M2 driver, and easy to launch off tee peg, fairway or first cut of rough. By no means cheap at £199 but this is certain to prove one of the most popular fairway woods of the season and we encourage you to form an orderly queue.